Exoplanets are being found so frequently now that they have become commonplace. But what about exomoons? As might be expected, they are much harder to detect, being typically much smaller than most planets. There have been tantalizing hints but nothing conclusive so far. That may be about to change soon, however. 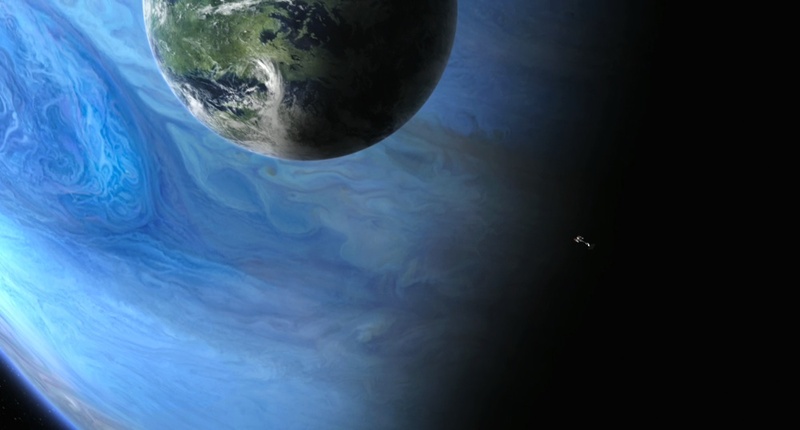 Astronomers from Columbia University have reported the possible discovery of the first exomoon – but they stress that it is still unconfirmed and just a candidate at this point. The tentative moon orbits a planet called Kepler-1625b, which orbits the star Kepler-1625. The star is about 4,000 light-years from Earth, and similar in size to the Sun, but with a mass 1.8 times that of the Sun. The planet is about the same size as Jupiter, but 10 times as massive. According to the analysis done so far, the moon would be the size of Neptune! There are no moons in our Solar System of that size, so this would be an unusual discovery if it pans out. The evidence for the possible moon is in the form of asymmetries in the transits observed as the planet passed in front of its star, as seen from Earth.